Author Grace Pundyk spills the beans behind her new book. Grace Pundyk’s new book, The Honey Trail: In Pursuit of Liquid Gold and Vanishing Bees, out this week, might just make you pause and reflect for a really long time the next time you take a gulp of honey. Honey, like tea or salt, has a history and story you’re not likely to have ever considered, except for when on 5th grade field trips or when getting the ‘ol birds and bees lecture, but the product has a rich and diverse series of practices surrounding its cultivation. Pundyk, who makes her home in Tasmania, has made the cultivation of honey the subject of her book, in which she uncovers a global snapshot of the honey industry today, from Yemen to Turkey to China. Fast Company gets the inside scoop on the world’s “liquid gold” and Pundyk’s new book. How did you decide to write about the global quest for honey? I first got into honey when I lived in Kuwait in the 90s, and tried some Yemeni honey. After that, wherever I travelled I would source local honey. I loved doing this, not only because I got to try loads of different honey, which I love, but also because I found that honey told me a lot about a place — its flora, climate, environment, people, history, and culture. Years later, when I was living in the UK, I started reading more about the industry itself and realized that in addition to the sweet side of honey, there was also a darker side; one that truly reflected the many facets of globalization. In fact, bees and honey are universal; you can link them to just about anything — politics, environment, history, mythology, religion and so on. So, as a traveller, a writer, and a lover of honey, embarking on a global honey journey was a fairly logical next step for me to take. Of course, I knew absolutely nothing about bees then, but boy, did I soon learn! How are modern beekeepers innovating to keep their farms and products relevant? Well, I am cautious in painting too black a picture, because I believe there is a growing awareness of bees and honey around the world, which is good. In terms of honey, people want to source the good stuff, they want to know that it’s untreated and unheated; they want to know, more often than not, that it’s locally produced. There is also a growing interest in different types of honey produced from a variety of nectar sources. This encourages beekeepers to produce a quality product, and certainly the ’boutique’ honey market is a niche industry that many beekeepers are getting into. I also like to think that this interest in honey is encouraging a broader understanding of plants and the environment in general. In ‘old world’ countries, such as in Europe for example, and also in Middle Eastern countries, there is already a honey-eating culture and a tradition of sourcing honey from the local beekeeper. In the ‘new world’ countries this interest is growing, but there is still a way to go. Having said that, I also think it’s very hard for most beekeepers. For example, in just about every country beekeepers are having to contend with the varroa mite, which lends itself to all sorts of problems with medicating the bees and managing your hives and the costs and education involved. It’s an ongoing battle and one that’s generally not fought effectively. And that’s just one ‘disease’, for want of a better term, in a list of many that bees are faced with. Then there’s the whole issue of competing with cheap imports. In the US, for instance, honey from China and Argentina is pretty well saturating a market dictated to by the global food giants. Local honey producers simply can’t compete in this arena where an often unsuspecting public are offered poor quality, imported honey, which in turn then impacts on the market because no one wants to buy it. Is there an industrialization threat in the global honey market? If you’re a local beekeeper and you can’t sell your honey for a decent price, then how else are you going to make a living from your bees? Through pollination services. But then you’re up for all sorts of problems born of mass-crop farming, such as the chemicals sprayed on crops, which in turn affects the bees. California’s almond industry is a case in point where billions of bees are trucked in from all around the country to pollinate the flowers. But it’s not just pollination services. In general our gardens and farms are saturated with various chemicals harmful to bees. Still, there are many beekeepers I know of who are insistent on making sure their bees are kept as far away from harmful chemicals and pollutants as possible. Of course, the more industrialized and populated the country the more difficult it is to do this, and yes, activism in beekeeping is a growing and necessary concern in many countries. What was the most surprising finding in your research? Lots of surprising findings, but I think the one that was the most inspiring was learning that the honey tested at Chernobyl did not contain as high a radiation as other foods. Scientists believe that the bees (and these are Russian bees, which are tough!) had a way of cleaning the honey. The elderly woman scientist I interviewed was also of the opinion that the darker the honey the better it was for fighting disease such as cancer. 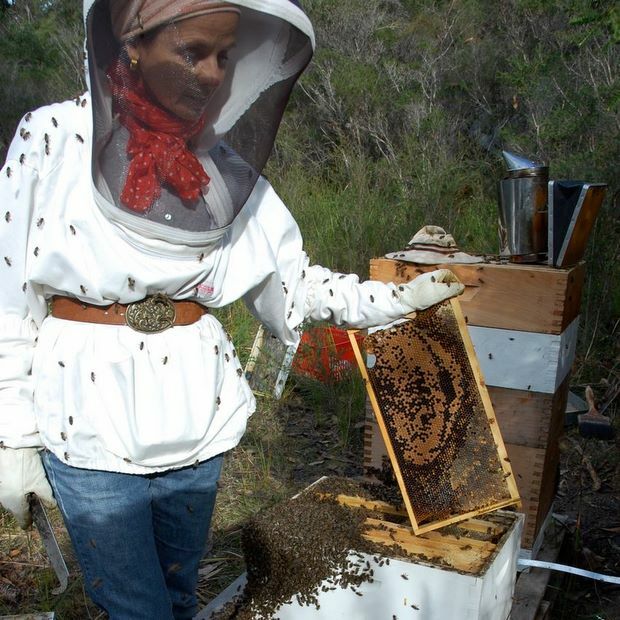 What would you say is the typical personality profile of a bee-keeping entrepreneur? I don’t think there is one! Where are the so-called “hot spots” for honey right now? Hot spots in terms of danger or popularity? China is the largest honey producer in the world and the Chinese are keen to dominate the world market. But, they are faced with all sorts of problems related to their beekeeping practices, such as the medicines used on bees that then adulterate the honey, which in turn means it is rejected in target markets like the EU. The country is faced with a huge task in educating the hundreds of thousands of beekeepers in best practice. Australia, being one of the few remaining countries not to have the varroa mite is at an advantage in terms of producing clean and green honey. The southern island of Tasmania, where I live, produces some great honey and we still have a fairly pristine environment with unique flora for the bees to forage. Yemen isn’t entirely safe, and beekeepers, like most men in the country, carry Kalashnikovs and AK47s. But the honey is incredible!